Irish Red Ales have always been hit and miss for me as the balance of malt and hops can easily become one-sided on the side of the malts making the beer overly sweet for me. 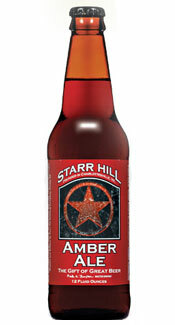 Thankfully the brewmasters over at Starr Hill have come up with an award winning recipe that maintains a strong malty sweetness and has enough hops to help balance the scales. Appearance: The color is a deep red honey. Clarity is great but the color is just a bit too dark to see through. Poured with a nice two finger fluffy off-white head that dissipated to a film that lasted during drinking leaving little to no lacing. Smell: As in true Irish Red Ale style the smell is sweet and malty. The first scents that come wafting through are caramel and bready malts followed by subtle dark fruits. There are little to no hops in the nose of this beer making it smell like quite the malty Irish brew. Initial Taste: Like the smell the flavor of this beer light and sweet. The smell is mainly sweet malts and toasted sugar. Even though this is predominately a sweet malty beer there is still a nice hoppy bitterness that helps cut through the malt and balance the beer (with the scales still on the malt side). There is a slight graininess to the beer as well which plays nicely with the other flavors. The finish is slightly sweet and yet dry enough to make this a great session beer. Thoughts: Irish Red Ales have always been hit and miss for me as the balance of malt and hops can easily become one-sided on the side of the malts making the beer overly sweet for me. Thankfully the brewmasters over at Starr Hill have come up with an award winning recipe that maintains a strong malty sweetness and has enough hops to help balance the scales. This beer has won the Silver Medal at the 2005 Great American Beer Festival, which is quite an honor. The beer is well rounded and what I believe to be a fantastic session brew due to the sweet yet dry finish that leaves you looking for the next bottle. I highly recommend this beer to malt and ale lovers alike. Previous: Summer Ale – Shipyard Brewing Co.